I recently posted a picture on Instagram celebrating my newfound body confidence, which I would like to explain in more detail. Loving our body is something that doesn’t come easily to most of us, and who could blame us? Whether it’s TV, Instagram, Twitter, magazines or anything else, there’s always someone out there telling us that we should look a certain way. We are told we must love ourselves, and then judged when we do. We are told we should own our body shape, but on the same page told how to dress to ‘flatter’ it which, interestingly, usually means ‘how to make your wonderfully unique body shape look as much like an hourglass as possible’. Despite all of the negative messages out there, especially on social media, I truly believe things are changing for the better. Every day, people are coming out and saying, you know what, I don’t care what I weigh or what my body looks like, I love it and I love myself. The body positivity movement is so beautiful and empowering in my eyes. One thing that’s coming up more and more is the lack of emphasis on weight, and it’s so overdue. More than ever, we are educated about health. We now know that size is not its only indicator. I believe so strongly that weighing ourselves often does more harm than good, which is why I have vowed to never do it again. Personally, I learnt this through experience. When I was a younger teenager, I was slim – around a size 8, but wasn’t healthy in mind or body. On the outside, I didn’t look like someone who ate badly and didn’t exercise, but that’s exactly what I was. For a few years, whilst dealing with anxiety, my eating habits were less than ideal. I would often not eat until 5pm after school (I wouldn’t eat earlier due to the anxiety making me feel sick), and from then would be so hungry I’d binge, usually on really unhealthy foods. My body image sucked; I hated what I saw in the mirror despite being what is generally viewed as a ‘desirable’ weight. When I was a younger teenager, I was one of those people who could eat whatever and not really gain weight, but at around 17, my unhealthy eating habits started to creep up on me. Before I knew it, I gained quite a bit of weight, which I knew because I was weighing myself daily. Fixated on my weight gain, I joined a very popular slimming group. Don’t get me wrong – I have nothing against groups like Slimming World and Weight Watchers. I know loads of people get great results and find themselves feeling more confident and healthy as a result, and if that is the way forward for you, that’s amazing! Personally, though, focusing on losing weight on a weekly basis only reinforced my fixation on those little numbers on the scale. I was not an overweight person, yet I felt fat and, at that time in my life, ‘fat’ felt synonymous with ‘bad’. It didn’t take long before I gave up, and was left feeling defeated. Here’s the thing. Fast forward a year, and I weigh 2 stone more than when I started trying to ‘slim’, and have gone up 2 dress sizes. I am the healthiest I’ve ever been, and have the healthiest body image to go with that. I eat 3 homemade meals and 2 snacks every day, and workout 4 times a week, but enjoy indulging in treats reasonably often. My relationship with food is finally becoming a lot healthier. Yes, I will always tend towards being an emotional eater, but I’m working on it in a healthy and positive way. I am ‘plus size’, and I am healthier than ever before. If the past 5 or so years have taught me anything, it’s that your health is not dictated by the number on the scales. When I weighed 8-9 stone, I was so unhealthy. I had no regular meal pattern, put no thought into my nutrition and lived off processed food. On top of that, I rarely took part in any physical activity, and my mental strength and resilience was really low. At over 11 stone, I am the happiest and healthiest I have ever been. I enjoy food; I enjoy food because it nourishes and cares for my body and also because it tastes amazing! I cook for myself every day, and enjoy real, full-fat versions of food instead of the chemically infused ‘diet’ products. Exercise comes easily because I have truly fallen in love with taking care of my body. And you know what the real turning point was? Leaving the scales behind and realising, I am a complex human being, who will never be defined by a number. The true path to a healthier and happier you is getting your priorities straight. Vow to adopt healthy habits because you honestly love to look after the body you have been blessed with, rather than to change the way you look. Love yourself first, exactly as you are, and the rest will come naturally! *The pictures at the top of this post show the difference in my body and more importantly, my confidence over the years. The first picture was taken around 5 years ago, and the second more recently. 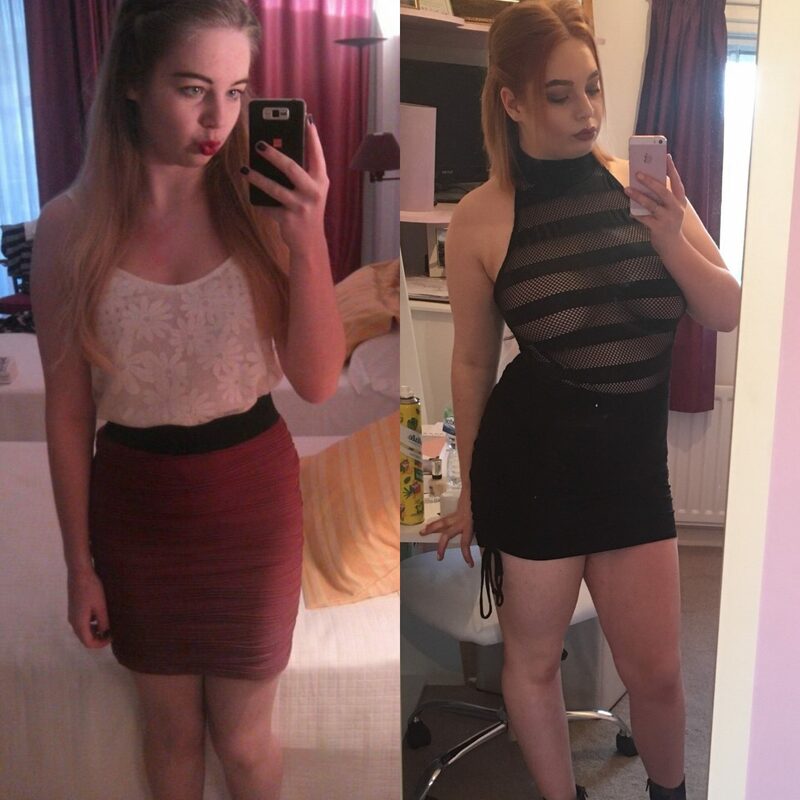 In the first photo I weighed over 3 stone less than in the second and yet, I don’t think I look massively different size-wise. I think this just goes to show that weight is only one indicator of health and the way a body looks, and that there really is so much more to being confident and healthy. Previous Post International Women’s Day: What is feminism?